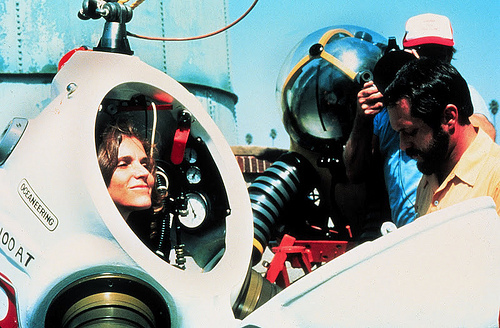 In 1979, Dr. Sylvia Earle made history off the coast of Oahu, Hawaii. Contained in an armored diving suit called JIM, she descended 1,250 feet (381m) while strapped to the front of a small research submersible. Once on the seafloor, Earle untethered herself from the vehicle and went exploring at a depth no human had done before — or has since—for more than two hours. Now, Earle is preparing to complete another dive in the same place where she made history more than thirty years ago. I recently sat down with Earle to discuss her past and upcoming historic dives. When recalling the last time she visited this deep ocean site, Earle’s face lit up as she described the abundance of life she was able to witness despite the darkness surrounding her. She recalls seeing sharks 18 inches long with bright green eyes, light-emitting fish that looked like miniature cruise liners and long-legged crabs clinging to large sea fans swaying in the current. The excitement and joy that Earle radiated when discussing her first walk in the deep was truly contagious. Listening to her vivid recollection one could easily be transported to the bottom of the ocean amongst thriving spiraling corals. Earle explained that she has been traveling the world, revisiting sites to see how ecosystems have changed. Over the course of her career, she has borne witness to the loss of biodiversity and abundance of life in the world’s oceans. While Earle doesn’t know what awaits her down there, one thing is for sure — the world she will leave behind when she begins this dive is very different from the one that faded away above her in 1979. Back then, no one was worried about climate change, and ocean acidification was not yet in the vocabulary of marine scientists. The ocean appeared to be huge and limitless, and Earle’s JIM suit dive represented a huge step forward for human exploration. This time around, Earle will be making the dive with the Hawaii Undersea Research Laboratory (HURL) in a Pisces sub. Earle’s upcoming dive represents many different things but, perhaps most prominently uncertainty about how the specific site has changed, the future of HURL and deep-sea exploration. Earle calls this “the sweet spot in time.” The ocean is full of life and power. There are Hope Spots throughout the ocean. There are areas that still thrive. We now have the knowledge and power to protect these critical ocean ecosystems. Sylvia Earl was my hero growing up as a budding marine scientist, and this dive (when I was 12) fueled my interest and intrigue. Great to know she is still out in the field!